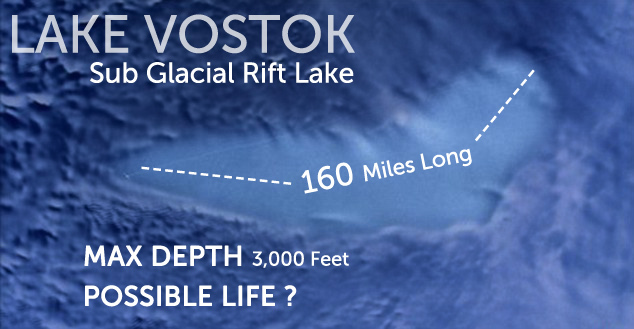 Lake Vostok: Earth’s Hidden World? I watched a BBC documentary last night about Lake Vostok, the enormous lake that lies thousands of feet below Antarctica’s frozen ice. The documentary explores how this lake was discovered, and the incredible task of drilling through miles of ice to get access to it. As compelling as the human task has been, the potential for new-to-science life to be discovered in this ancient lake is far more exciting. After drilling for two decades through more than two miles of antarctic ice, Russian scientists are on the verge of entering a vast, dark lake that hasn’t been touched by light for more than 20 million years.Scientists are enormously excited about what life-forms might be found there but are equally worried about contaminating the lake with drilling fluids and bacteria, and the potentially explosive “de-gassing” of a body of water that has especially high concentrations of oxygen and nitrogen. To prevent a sudden release of gas, the Russian team will not push the drill far into the lake but just deep enough for a limited amount of water — or the slushy ice on the lake’s surface — to flow up the borehole, where it will then freeze. 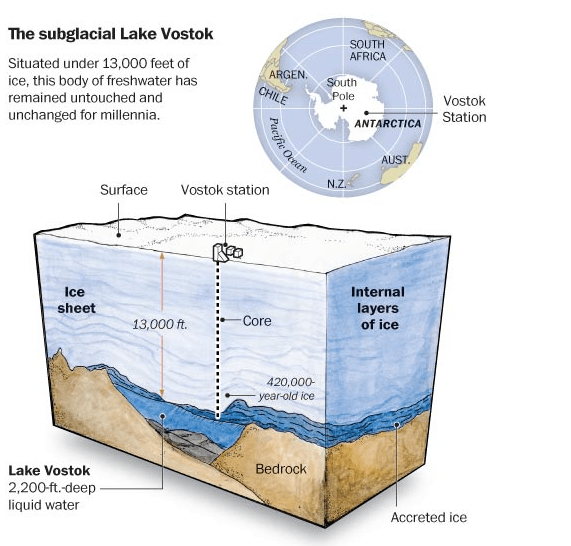 Reaching Lake Vostok would represent the first direct contact with what scientists now know is a web of more than 200 subglacial lakes in Antarctica — some of which existed when the continent was connected to Australia and was much warmer. They stay liquid because of heat from the core of the planet. “This is a huge moment for science and exploration, breaking through to this enormous lake that we didn’t even know existed until the 1990s,” said John Priscu, a researcher at Montana State University who has long been involved in antarctic research, including a study of Vostok ice cores. If the Russians break through as planned within the next week, it will cap more than 50 years of research in what are considered the harshest conditions in the world — where the surface temperatures drop to 100 degrees below zero. That extreme cold is likely to return within a few weeks, at the end of the antarctic summer, putting pressure on the Russians to make the final push or pull out until the next antarctic drilling season, starting in December. The extreme cold, which limited drilling time, contributed to the long duration of the project. The Russian team also ran into delays caused by financial strains and by efforts to address international worries about their drilling operation.